The Proposal Toolkit is a powerful resource for fundraisers looking to create a polished, on-brand document to support their ask… but have you considered making flyers with the Toolkit? That’s no joke—the Proposal Toolkit was designed to make more than just proposals. It is particularly well-suited to creating proposals, but its modular design allows for the creation of any number of documents that can aid your development efforts. This is one I’ve heard about a lot: many fundraisers rely more on menus than full-fledged proposals. These documents, which give a prospect a quick, cursory look at a number of funding opportunities, are very easy to make with our templates. 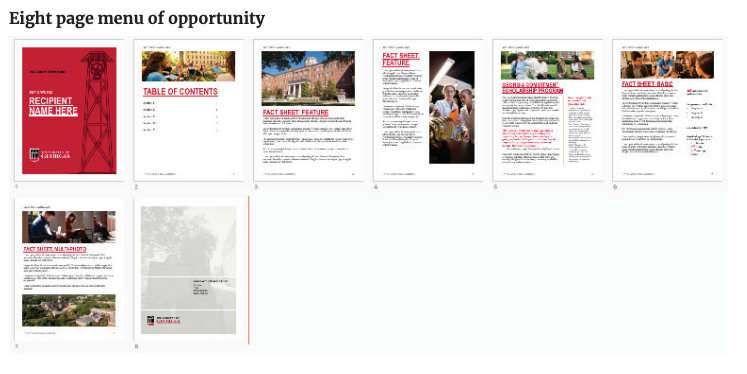 Depending on how many opportunities you’re trying to highlight, you can dedicate a Fact Sheet to each area. Or for a simpler approach, you could use a Cover Letter page (with only a single large text box on the page) to type up a text-only, bulleted-list menu. Here’s an example of how you might layout the former. The one-pager is another very common request. 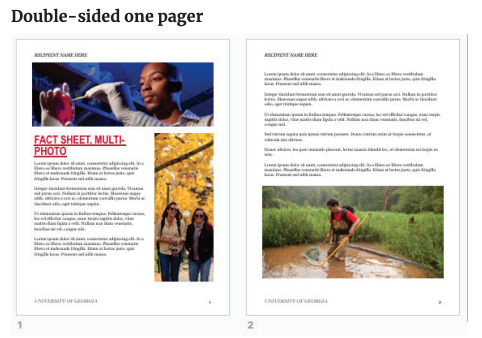 If you’re trying to create a single-page document (printed front-and-back or not) to profile one specific subject, you could start by opening a template file and deleting the cover page. That might sound a little counter-intuitive, but you’d be much better served by starting with a Fact Sheet that immediately delves into the information you’re trying to convey. Of course, there’s nothing stopping you from making a double-sided one-pager where the front is a cover page and the back contains all your content, but if you need to express a considerable amount of info, I would begin with a Fact Sheet, then add a Continuation Page, and you should have all you need to make a nice leave-behind. Sometimes you need to print just a letter—a simple, personally written document you can print off, sign and drop in the mail. Using stationary is preferable, but you don’t always have that handy. This is another area where our templates can help. Open a template file, delete the cover page, add a cover letter page and you’re off! 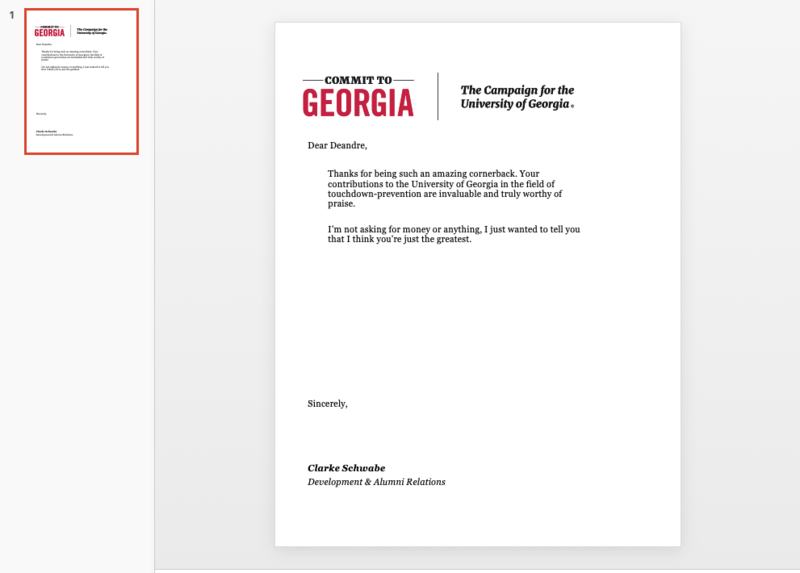 You can even personalize the logo at the top by inserting your own unit logo there if you wish (or whatever UGA logo might be most relevant—any of which can be found via the logos link in the Toolkit). For details on how to remove the existing logo, add your own or other template changes, refer to our Template Tips document in the Toolkit. 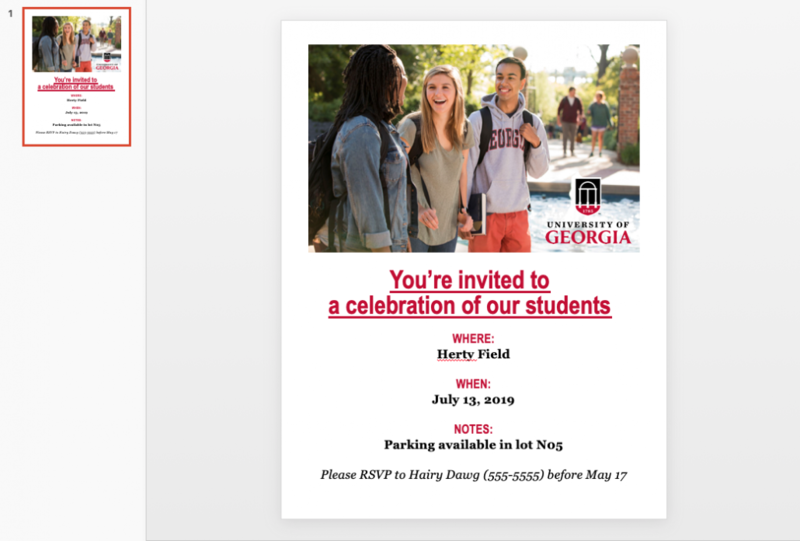 For your pop-up events and those quick-turnaround, small-audience engagements, it’s a simple task to turn the templates into a UGA-branded invitation you can deliver digitally or physically. The Fact Sheets that feature a single, large photo are probably best suited for this—personally, I’m a fan of the Horizontal Feature sheet for this use. And using the photos and logos linked from the Toolkit and a little bit of formatting, you can construct event invitations on the fly, wherever you are. In fact, using the templates in this way has proven so successful for some of our fundraisers, that we have built a template file geared specifically for event invitation creation and will be making it available on the DAR site soon—stay tuned!